It is not an acronym! It's an old Welsh word for the wandering minstrels - musicians and poets - of times gone by. Clerwr would be the minstrel himself (plural clerwyr); clera is the verb. You can download a copy of Clera's constitution here. Clera organises and promotes Workshops, tune clubs and sessions across Wales. Our Sesiwn dros Gymru project funded by the Arts Council of Wales ran a wide range of workshops, classes and sessions across Wales from March 1st 2012 to March 1st 2013. More workshops and classes followed in our Alawon Cymru initiative which ran from May 2013 to June 2014, again supported by the Arts Council of Wales. 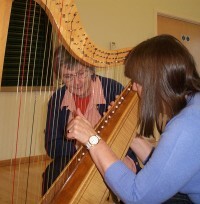 Alawon Cymru included support for local tune clubs to learn and play Welsh traditional tunes across Wales as well as supporting workshops and individual totor sessions. These continue: see the latest information and a collection of tune sets on our website www.sesiwn.com. The Telynor Cymru 2016 project finally closed in 2017, again with the support of the Wales Arts Council with groups across he country learning and playing Welsh Gypsy harp tunes. Its website remains, providing a wide range of tunes with music, guidance and instruction videos on www.telynor.cymru. The Alawon Sesiwn book of session sets of Welsh traditional tunes was published at the end of the Alawon Cymru initiative, with 81 tunes presented in 26 sets. Supporting this is the Alawon Cymru website where you can hear the tunes as well as reading the music score. Clera conducts classes and sessions in Tŷ Gwerin and has a stand in Y Bwthyn. Latest information is posted on www.sesiwn.com. first and third Monday of the month. There is a collection of Welsh traditional tunes that you can download on Clera's Alawon Cymru website alawoncymru.com. Clera Workshops and sessions in various parts of Wales.